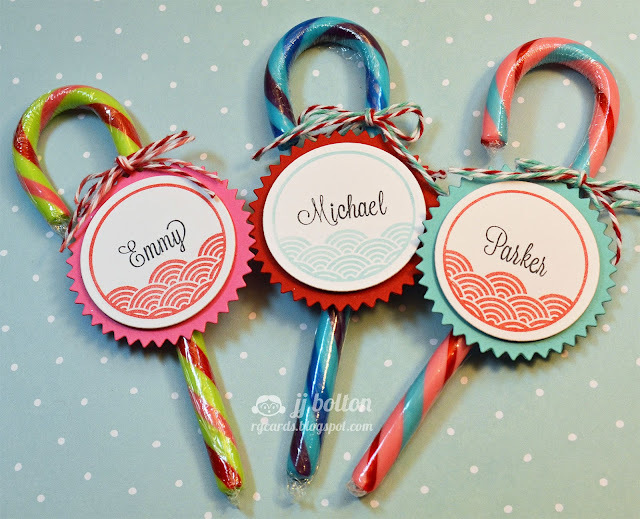 My last project for the week is this set of candy cane favors! Don't you love that candy canes come in fun colors now? 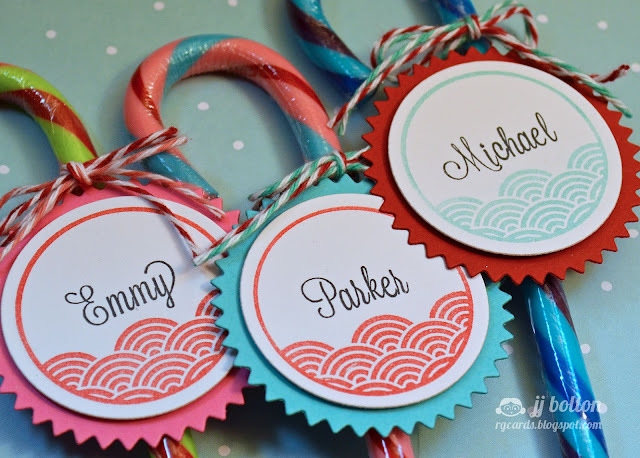 I used the circle medallion stamp from last month's Fanfare set to make some cute and EASY custom labels for my nieces and nephew. The circle design kind of reminded me of peppermint candies. Lining up alpha sets can be intimidating, but it was actually easier than I expected. 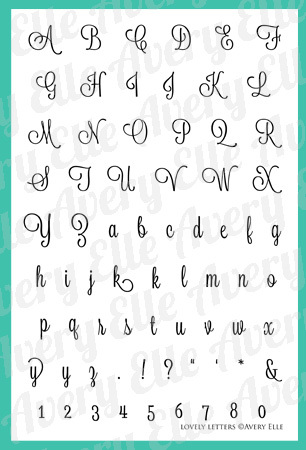 Just make sure you pencil in a line to keep you straight:) As you can see, I spaced the letters closer together to get that seamless look. 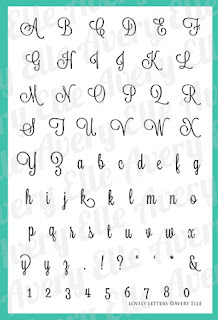 I can't get over how pretty that font is! That's it for me! 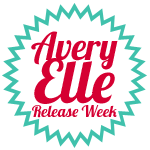 I really hope that you enjoyed this week's projects! I can't wait to see what Jamie, Chunyuan, Kasia, and Heather have today! Great projects JJ! 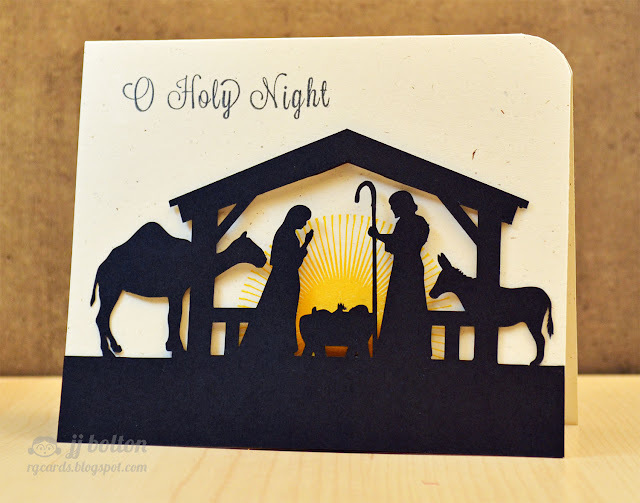 My favorite is the O Holy Night card. Just perfect, love the silhouette! Ooooh....these are all fab!! 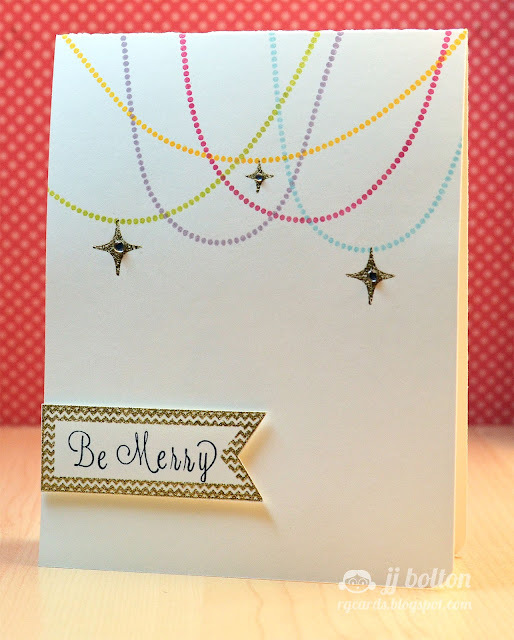 I love the hanging stars on that first card...especially with the colorful bunting!! The Nativity scene cutout on the second one is amazing...and those candy cane tags are just darn sweet! Great job! These are AMAZING! YOU are amazing! WOW! You're killing me here!! How do you think of these. My brain is still on the first photo with the strings of colorful beads and perfectly placed ornaments - so clean and really stunning, and then you have 2 more projects???!!! I don't know how you do it JJ! All beautiful! Fabulous projects JJ! The nativity scene is amazing! How on Earth did you think of multicolored garland from a strip of dots?!? I just LOVE, love, LOVE it!!! That nativity scene is magical! You always make me want to order it all and this month is no exception. Great cards, JJ! WOW Stunning projects. In Love with your first card with those garland..So cool and so creative. Love your projects. The stars hanging from the dotted line garland is pure genius, and I am totally CASE-ing the Candy Canes for my holiday table this year. Thank you for the inspiration!! Beautiful projects - all of them!